The Pest Control and Public Health Conference, arranged for the first time during the third edition of EcoWASTE, aims to address plans to reduce the negative impacts of pest control with a sustainable and environmentally cautious approach. Illegal pesticide substances and unauthorised pest control companies have proven to be harmful for the environment, and have been responsible for a number of deaths and serious illnesses in UAE over the past few years. “A lack of awareness of safe pest control methods has a negative impact on the environment, as well as the health of UAE residents, making it a main priority for Tadweer,” says Eisa Saif Al Qubaisi, general manager of Tadweer. “The main objective of the Pest Control and Public Health Conference is to discuss ways in which harmful pests can be eliminated to reduce diseases, such as malaria in the region, through the adoption of effective, low-toxicity, and eco-friendly pesticides,” adds Mohammed Al Marzouqi, Pest Control Project director at Tadweer. Global experts and leaders in the pest control industry from Australia, Spain, the US and the Middle East, including the UAE, are expected to discuss the latest industry trends, and highlight healthier alternatives to pest control procedures. Other key topics to be discussed include the use of environment-friendly and low-toxicity substances, safe handling of pesticides, biological pest control through adopting Integrated Pest Management (IPM) programmes, and efforts made in the UAE toward the eradication of malaria, in collaboration with the Ministry of Health. EcoWASTE is held in strategic partnership with Tadweer, as part of the annual Abu Dhabi Sustainability Week hosted by Masdar. EcoWASTE 2016 will take place at the Abu Dhabi National Exhibition Centre on January 18-21, 2016, and is co-located with World Future Energy Summit and International Water Summit. The event is expected to bring together more than 50 exhibiting companies from 17 countries, and more than 4,500 trade visitors from the waste industry. 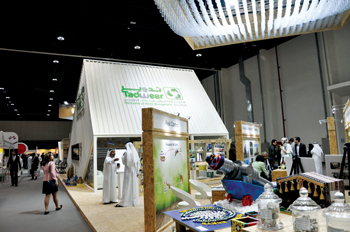 Tadweer was established by the government of Abu Dhabi in 2008 in efforts to become recognised as a global leader in sustainable and integrated solid waste management. The center is the lead agency responsible for controlling and coordinating waste management activities throughout the emirate. This includes implementing a comprehensive waste management strategy set to be fully implemented by 2030, and all aspects of service delivery required to establish a fully integrated waste management system in the emirate.